Used Volkswagen Touran Review - 2015-present | What Car? What's the used Volkswagen Touran MPV like? The Volkswagen Touran’s job has always been simple enough: to add seven-seat versatility to a car not much bigger than a Golf Estate, and all without being van-like to drive. 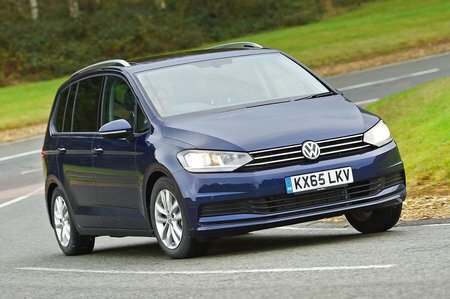 However, while the original Touran went on sale in 2003, it took until this all-new model, launched in 2015, for it to finally fight for the honour of being best in the mid-size MPV class. The fact it has twice been voted our MPV of the year (in 2016 and 2017) shows how good we think it is. 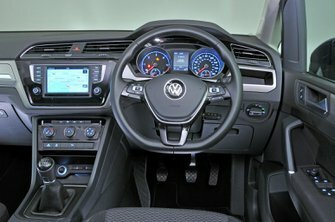 The Touran shares much of its hardware with the contemporary Golf, which means it has a dashboard that is both classy to behold and easy to use, and that it maintains an excellent five-star crash test rating from Euro NCAP. Equally as impressive is the way the Touran drives in much the same way as a Golf, meaning it is quiet and comfortable, but also that it doesn’t fall over at the first sign of a corner. True, it’s still not as much fun to drive as a Ford S-Max, but it’s a cut above most other seven seaters, while the square shape and large windows also make it easy to park. Most important of all, though, is how brilliantly clever the Touran’s interior is. For a start, the second row is made up of three individual seats so that it is possible to carry three child seats side by side (in fact, the Touran has Isofix mounting points on six of its seven seats). What’s more, these chairs all slide and fold independently of one another, and the outer two seats also tilt out of the way to make scrambling into the rearmost row fairly easy. Those final two chairs fold easily out of the boot floor, leaving just enough room for a couple of bags of shopping. Tuck them away, meanwhile, and you get van-like luggage space, which can be extended again by folding the second-row seats flat into the floor, and even dropping the passenger seat flat too. For a car that’s far from bus-like in terms of overall size, the Touran really is admirably accommodating. Volkswagen has always sold the Touran with petrol and diesel engines but, with the latter outnumbering the former by about 20 to one on the used market, you’ll need to be prepared to search if you really don’t want diesel. There is, however, a good supply of Tourans equipped with VW’s DSG automatic as well as versions with a manual gearbox.